What are the commissions Paid by Morris Murdock Travel? As a professional agent you will receive 70%** of commission paid by the supplier. Morris Murdock Travel is a top producer with the nation’s largest Cruise Lines and Tour Operators and receives the highest commission levels possible. This in turn translates into higher commissions for you. What kind of travel benefits do I receive? You will be able to receive the same travel benefits available to travel agents under the current IATA rules (International Association of Travel Agents). In addition, Morris Murdock Travel will make available to you various supplier familiarization trips as they become available. 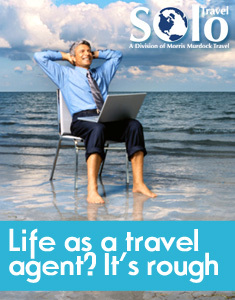 Do you charge any fees for being a Solo agent of Morris Murdock Travel? We charge a minimal fee for being part of network. Contact us for details. Do I have access to any travel industry technology? We make available to you Sabre for all your GDS needs as well as the various technology systems from the Cruise Lines and Tour Operators. Morris Murdock Travel believes training is essential to compete in today’s travel market place. We conduct regular training sessions via WebEx on everything from product knowledge, sales skills, and many other topics. What support does Morris Murdock Travel Supply? 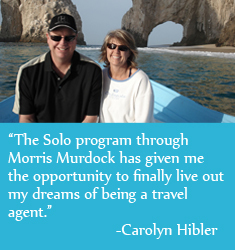 Morris Murdock Travel has a dedicated team of professionals supporting our Solo Agents. They are there to help with everything and anything that comes up—Sabre questions, supplier questions, or issues as well as general day to day business.